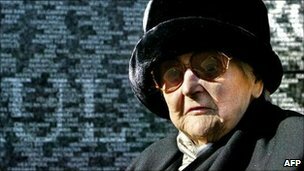 One of the most highly decorated Allied secret agents of World War II, Nancy Wake, has died in London aged 98. Born in New Zealand but raised in Australia, she is credited with helping hundreds of Allied personnel escape from occupied France. The German Gestapo named her the "White Mouse" because she was so elusive. Australian Prime Minister Julia Gillard said Mrs Wake was "a truly remarkable individual whose selfless valour and tenacity will never be forgotten". "Nancy Wake was a woman of exceptional courage and resourcefulness whose daring exploits saved the lives of hundreds of Allied personnel and helped bring the Nazi occupation of France to an end," Ms Gillard said in a statement. After the fall of France in 1940, Mrs Wake became a French Resistance courier and later a saboteur and spy - setting up escape routes and sabotaging German installations, saving hundreds of Allied lives. She worked for British Special Operations and was parachuted into France in April 1944 before D-Day to deliver weapons to French Resistance fighters.At one point, she was top of the Gestapo's most wanted list. "Freedom is the only thing worth living for. While I was doing that work, I used to think it didn't matter if I died, because without freedom there was no point in living," Wake once said of her wartime exploits. "I have only one thing to say: I killed a lot of Germans, and I am only sorry I didn't kill more," she once said. She was Australia's most decorated servicewoman, and one of the most decorated Allied servicewomen of World War II. France awarded her its highest honour, the Legion D'Honneur; she also received Britain's George Medal, and the US Medal of Freedom. In 2004, she was made Companion of the Order of Australia. Wake died in London. She had been a resident at a nursing home for retired forces personnel since 2003. She is expected to be cremated and her ashes spread in Montlucon in central France, the scene of much of her heroism. Her story inspired Sebastian Faulks' 1999 novel Charlotte Gray and a 2001 film by the same title, with the lead role played by Australian actress Cate Blanchett. "greeney2" wrote: What happened to Rath? Im still around, keeping an eye on you all. no threats about that mate. I may even pop in again sometime soon. You may recall i did a post about Nancy Wake ( A.K.A ... the white mouse ) on the old B.V as part of my ANZAC day posts. she will always be remember, & with good reason. she will always be remembered. there are many famalies that her life, and her work changed. for the best! wish there were more like her! this country needs people like her.